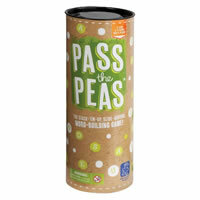 Both educational and fun, Pass The Peas is a great word spelling game that is great for the whole family. Players will literally pass the peas as they build words on top of other player's letters. Taking only around 15 minutes to play, this game is great for a fun activity when you have a couple minutes to spare. This fun themed pea game is a favorite for schools, homes and youth groups. With simple rules on how to play, you won't need to understand complicated rules to play. Scoring is easy and doesn't take a lot to keep track of the current score. Give Pass the Peas a try today! Gain the most points and you'll be the winner. You'll get 4 pea pod letter holders, 180 letter peas, 4 pea baggies, 1 sand timer and the official Pass The Peas game rules and instructions. Please keep in mind that the official Pass The Peas childrens rules and instructions could be different depending on the game version you have. The rules below are some of the exact directions on how to play Pass The Peas. Share with us your comments, funny stories, tips, advice, strategies, creative ways to play, questions about how to play, problems with the rules or anything you want about Pass The Peas. All submissions will be reviewed within 24 hours. Click here to add your Pass The Peas comments.